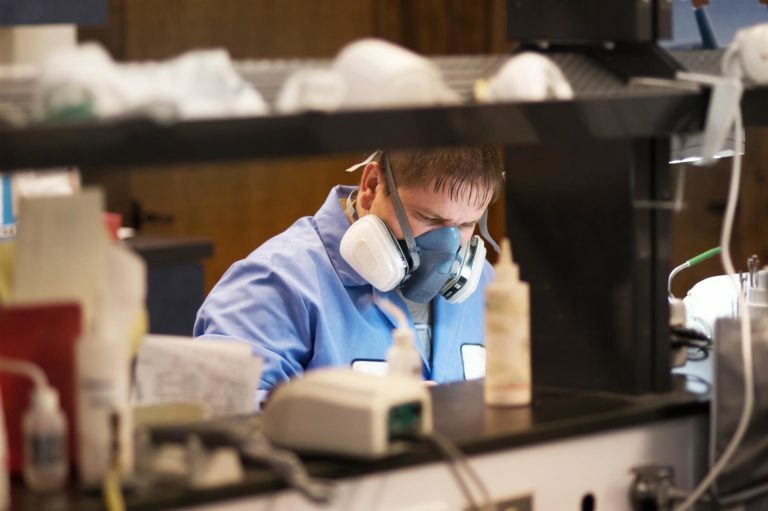 Part of lab planning and design is including the proper equipment, hoods, tables, benches, cabinets, and other such items that will be needed to perform the desired work. Whether you are part of the design team or leading the project, one rather important aspect you need to remember is the lab will have to meet various state and federal regulations and requirements. It is important to find out what these are for your type of lab environment to ensure it is designed correctly with sufficient ventilation and plenty of vent/exhaust hoods. Unfortunately, each regulatory agency has their own recommendations, requirements, or regulations depending on the specifics of the environment. In regards to air changes per hour (ACH), which is the number of times per hour the air in the entire lab is replaced with fresh air, they vary from one agency to the next. This agency does not have a specific requirement for airflows, but rather a generalized recommendation, which is between 4 ACH and 10 ACH, based upon the needs of the lab environment. ANSI/AIHA does not provide any strict requirements for airflow because the standards and conditions of each lab can and does vary, so each lab must determine the appropriate design for proper ventilation. The only standard requirement this agency prescribes is in cases where chemicals are present. The standard simply states exhaust, fume, and vent hoods will be run continuously while chemicals are present. OSHA also has a broad recommendation for airflow rates that range from 4 ACH to 12 ACH and only provides a generalized recommendation on adequate airflow rates. Their recommendation does mention that ventilation should not be solely relied upon for protection when working with toxic substances being released into the lab’s air. This agency is the one most people refer to when establishing standards for proper ventilation and indoor air quality. When it comes to labs, there is some ambiguity about the recommended ACH. For instance, the recommendation refers to “educational science labs” but not laboratory work environments. Previously, there were two different listings, one for science labs and another for educational facilities. Currently, the recommend ACH for educational science labs is 1.2 ACH. In the previous versions, from 2006 and earlier, the recommend airflow rate for science labs was 6 ACH. AHRAE also publishes specific books that are used by the HVAC industry. Within these are specific chapters that contain minimum recommend airflow rates for laboratory environments. For environments where animals are not present, the current minimum is 8 ACH, with a maximum of 12 ACH. In cases where animals are present in the lab, a minimum of 10 ACH and a maximum of 15 ACH is recommended. As you can see, each agency has different recommendations without any currently mandatory regulations. It is your responsibility to determine the most appropriate ACH for your lab to help keep your employees safe. For assistance with planning, design, and lab furniture, hoods, and accessories, please feel free to contact Genie Scientific at 800-545-8816 today!